We are a leading supplier of Chequered Plate. We provide a wide range of Chequered Plates, which are manufactured using qualitative raw materials and available in different designs. Used in diverse industrial applications. We offer to our clients a wide range of Stainless Steel Chequered Plates that is fabricated using quality Duplex Steel grades material. These Plates are available in different sizes and are widely used in cement and construction industries. Moreover, we also customize our range as per the requirements of our clients. Feel free to contact us. - Range: 0.5 mm To 200 mm thick in 1000 mm TO 2500 mm width & 2500 mm to 12500 mm Length available with NACE MR 01-75. - Material: Stainless Steel, Duplex Steel, Carbon Steel, Alloy Steel, Nickel & Aluminum. - Types: Sheet, Plates, Coils. - Form: Foils, Shim Sheet, Rolls, Chequered Plate. 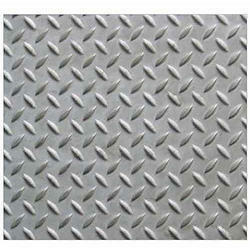 We are leading manufacturers and suppliers of chequered plates in India. These are made up of stainless steel material like aluminum, alloy steel, carbon steel. 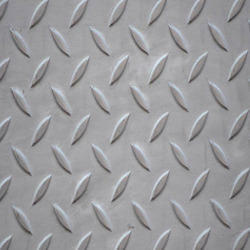 We are one of the most prominent manufacturer and exporter of Aluminum Diamond Tread Plate. These plates are widely used for chemical industry applications. Available with us at standard market prices, these plates are known for their advanced attributes such as corrosion resistant, tensile strength, and heat resistant.